Here is your reading & channeled message for the week of 3/12. As always, I asked the angels to please bring me a clean and clear message for you, my clients, students, and followers. For today’s message the angels took me to the Angels of Abundance Oracle Cards by Doreen & Grant Virtue, 1 card pull “for clarity”, I hear. 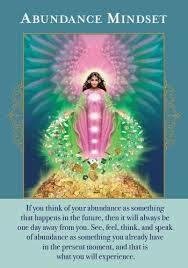 Today’s Card is ABUNDANCE MINDSET. This card comes to us when the angels want to remind us to watch our language — to be very aware of how we are speaking about abundance to others, and even more importantly, to ourselves. The angels suggest that you not “beat yourselves up” when you realize you’ve been talking in lack terms, but rather just notice, become aware, and move forward from there. Talking about worry, and worrying about lack, actually call in more worry and lack – you are that powerful a manifester, dear one, say the angels. Let that go already, they say. Relax, envision yourself as abundant as your heart desires, and revel in that imagining beloved ones, they say. Make time each day to sit for just a small while and in that still time imagine having everything you want and need here, right now, as completely and fully and abundantly as you wish. We know this sounds sort of crazy, especially if you are coming from lack these days, they say, but it will begin to shift the reality. And that reality will shift into more of what you want each time you take those few minutes for yourself and imagine. Start now, they say, right now. No hesitating. Begin as you mean to go on. You are so loved, say your angels, and you can do this — we’re right there with you cheering you on — feel free to ask us for help remembering to do your imagining, and we’ll remind you somehow. Stay open to receive our messages and our nudges. We love you so much. And with that we are complete.